It is important that you get to MEET ALL OF US! We do not hide behind a computer screen and are proud to share our family with you. Many websites do not even have a picture of the breeder you are dealing .with. So how are you to know who you are getting your puppy from. A picture speaks a thousand words they say. So I hope you enjoy the pictures we share and all the people that play apart in our puppies lives. It takes a "Village" to raise a happy healthy puppy! Meet the Official Team Of Priceless Pups ( There is a lot of us so make sure you read the entire page) Myself, my children, Our vets, our vet techs, our shipping staff, our dog trainer, our groomer and many more! We are one of the only breeders who introduce you to EVERYONE in your puppies life! You never get to see many of the breeders online or where your puppy is coming from. This is one of the most important pages on our site! Please dont skip through it. This is me Steffy AKA The Shorkie Queen!!! LOL! I have built Priceless Pups with you, our potential puppy parents in mind. I pride myself in my ORIGINAL content and IDEAS that separates me from the pack if you will. I am the only Shorkie breeder that can offer you 20 plus yrs of experience in the Shorkie breed because I started the breed. Shorkies are not my JOB they are my Passion I am also the proud owner of Tacoma Dog Grooming. There is a huge difference between a breeder that lives with their dogs as a part of their family and a breeder that lives OFF OF THEIR dogs as a source of income. Our Dogs are 100% family members first and foremost! From the day our puppies are born... we bond with them by bottle feeding them along with them nursing from their moms. So our socialization starts from the day they are born! Check this bottle feeding video out. No other breeders we know implement bottle feeding as a part of their daily routine. This is so important to the puppies and why our puppies love people so much. They learn from the day they are born that human hands and loving and kind and nuturing. I only breed Shorkies and do not divide our breeding practices or attention elsewhere or amongst other breeds. This is one of the main reasons people like getting a puppy at Priceless Pups because they know our focus is on the betterment of the Shorkie breed. The only time we do any other breedings are Shih zu and or Yorkie to keep back a puppy for our family and breeding practice. We do not DABBLE in other breeds to ensure you are getting the best of the best. This is to ensure you are getting the very best Shorkie possible. Shorkies are my PASSION and my field of EXPERTISE! I am proud to be your Shorkie Expert, the founder of the Shorkie breed and Shorkie Club Of America. MY main goal is to educate you the public on how to adopt a Shorkie puppy from a reputable breeder and give you a clear idea of who we are, what I believe in and why I am different from other Shorkie breeders you may find elsewhere. Our Dogs are all family members and genetically tested prior to every breeding and vet checked on a regular basis to ensure the health of our dogs and the offspring they produce. Our Priceless Pups Buyer protection plan is one of kind! From the time your purchase your puppy we ensure your investment every step of the way. Being responsible is what we do! Introducing you to our Priceless Pups Family and Team and involving you in everyway we can think of are just a few of the things that have become “OUR SIGNATURE” here at Priceless Pups. No other Shorkie breeders offer this. We want you to feel comfortable every STEP OF THE WAY when you adopt a puppy from Priceless Pups so we involve you in the entire process. We recognize the importance of letting you in to our lives and into the entire process of what goes on in our puppies lives. If there is a puppy you are interested in please fill out the adoption form and we will get right back too you and we can get to know one another and see if we have a puppy that is a perfect match for your family! The one thing I can guarantee is that I am the EXPERT IN Matching puppies AND PEOPLE! So come in take your time and enjoy the site. If you have any questions I am only a phone call away. 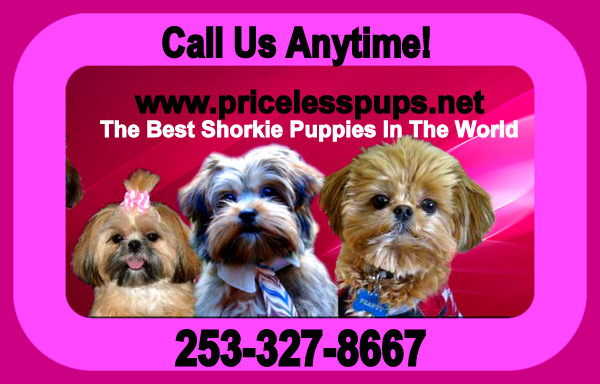 Please remember Priceless pups is not just a place to buy or adopt a Shorkie is a placed where you get to become a part of the largest growing Shorkie Communtiy in the world. Introducing the newest member to the Priceless Pups Team! Felix our cat! So many of our potential families already have cats and always ask us how Shorkies do with cats. Prior to adopting Felix I could only answer ,I "THINK" they will be fine. But now we have Felix and he is already socializing all our puppies. By addinig Felix to our family we have yet again added a whole new dimension to our puppies lives. Our Shorkies will be amazing with cats. Thanks to Felix. (PS, I have never owned a cat.. man oh man was I missing out.. They are a HOOT! Enjoy Little Bit and Felix!!!! Dr Sage is the Head Vet at Parkway animal hospital and will be glad to talk to you . Dr sage does most of our surgeries. She is not only a vet of 36 plus yrs she is also a breeder of Australian Shepherds and does agility and confirmation trials. I am so blessed to have her expertise that she is willing to share and pass on to me one breeder to another from a vet's point of view and I am like a sponge and soak it all up! Here is a video at the vets office and how comfortable my puppies feel there! It is with extreme pleasure that I write this letter of reference for Stefanie Bailey owner of Priceless Pups who is a regular and well known client at Parkway Animal Hospital. Her passion and dedication to ethical breeding in clearly evident. The care her dogs and puppies receive is nothing short of excellent. Her dogs and puppies are always well groomed, well cared for, very easy to handle and extremely well socialized. She is very selective in her breeding program and does everything in her power to ensure that any dog she considers breeding is checked out and genetically tested and screened prior to being bred. I have personally altered dogs that were not of breeding quality that she had altered to make sure it was never bred and placed in a pet home . Stefanie's main goal is very obvious and that is to never knowingly pass on any genetic problems on to the puppies she produces. Stefanie is constantly striving to educate herself and better her breeding practices and spares no cost to do so from her regular vet appointments and checkups to the testing she has done on her dogs. Her dogs and puppies are family members and she does not operate a kennel. She is a model breeder and pet owner. I wish all pet owners and breeders were a conscientious as she is in her care of her canine family members. Please feel free to contact me personally at anytime and if you have any questions or concerns. I would personally recommend Stefanie as a breeder to anyone who was looking for a new puppy to add to their family. Meet Our Eye Doctor ( Doctor Victoria Jones) who does all our Cerf testing ( eye testing) to ensure our dogs are clear of any genetic eye diseases. Regular vets CANNOT do eye testing. We are so excited about her new location that is so much closer. Everyone loves our dogs and our Yorkies get RAVE reviews for how well mannered they are! Dr. Jones earned her veterinary degree in 1992 at the University of Illinois, where she graduated as the valedictorian of her class. She then completed a one-year rotating internship in small animal medicine and surgery at Cornell University. From 1993-1997, Dr. Jones completed a comparative ophthalmology residency at the University of Missouri. The residency was combined with a graduate program and in 1997, Dr. Jones received her Master of Science in Veterinary Medicine and Surgery for the study of diagnostic testing for feline herpesvirus. The same year, Dr. Jones passed her board examinations and became a Diplomate of the American College of Veterinary Ophthalmologists (DACVO). Dr. Jones has been an author or co-author on several ophthalmology articles and has been the sole author of two book chapters in the field of veterinary ophthalmology. Her special interests within the field of veterinary ophthalmology include corneal and intraocular surgery and ocular manifestations of systemic disease. Meet Official Certified Dog Trainer. and very own dog whisperer. "Lesha"
Lesha is our Professional Dog Trainer 20 plus yrs experience. Lesha is truly a DOG whisperer a Lesha is AMAZING!!! We are proud to add her and her husband to the Priceless Pups family. With Lesha on our team our puppies have s "PAW" above the rest. This is Lesha our Official Dog trainer working with Tootsie. Tootsie was born and being raised here. Our newest addition to the family! Here is are some simple things you can do at home and basic imprinting that our Priceless Pups will have when they arrive home to you. Lesha is amazing at working with puppies and as you will see after getting to know her over a two week period Tootsie responds amazingly to her. Lesha's gift is evident in this video. Thank you to Jeff Lesha's husband for the video. For our local families here we highly recommend Lesha and her training programs. Lesha and Jeff are also working on a PUPPY MANNERS 101 class that our out of state clients can enroll there puppy in prior to going home for two weeks. Once we have worked out all the details we will make it available to our out of state families. n the above video the above the type of clicker we use to introduce the puppies to is one that has a pull out stem on it. It allows you to get the attention of the puppy much easier. Here is a picture of it. You can get it at any Pet Co!!!!! Tootsie also responded more so to a TOY REWARD verses the food reward. Some dogs are motivated by toys and not treats. It is up to you to get to know what motivates your dogs the most and use that for training. Some of Lesha’s recent accomplishments include passing the AKC CGC (Canine Good Citizen) test with her Standard Poodle, and placing first in a Personal Protection trial held by Butch Cappel with her Belgian Malinois. She attended a dog behavior seminar by world renowned dog behaviorist, Cesar Millan, the Dog Whisperer, studied dog behavior with experienced dog behaviorists and trainers. She also has extensive knowledge of breed specific traits through her own personal experience and hours upon hours of research. This is our Official Dog and puppy groomer for Priceless Pups and has been for years now. Marhen is your puppies first experience with a groomer and makes sure it is a positive one. Each and every puppy have been groomed professionally 2 times by Marhen prior to leaving us. Marhen's dedication to my dogs and my puppies is UN HEARD OF! She Opens up her shop on Sundays just to groom our puppies and my dogs to ensure our puppies are in a SAFE AND STERILE environment. Now that is dedication. She makes sure that every puppy understands what it is to feel safe at the groomer. Puppies need to be exposed to different situations to build up their self confidence. This is all part of of Mental stimulation program we focus on at Priceless Pups. NOTE: We are the only website makes sure your puppies have been professionally groomed before they leave us. This is our son Nehemiah. He is 16 yrs old and 6 foot 2.. 230 lbs of nothing but TEDDY BEAR ! "Nemee as we call him here at home has got one of the biggest hearts I have ever experienced. He is my right hand guy here at home. . Oh and I forgot to add. HE NEVER ALLOWS me to go to the airport alone!!! That child will drop everything to make sure he goes with me and takes care of his Mamma!!! The pictures is with Nemee and Winston. Our English bull dog that belongs and lives with my oldest son John John . This was Winston as a puppy. his video is of Gracie our Miracle Shorkie that lived. She is 100% Nehemiah's dog as you will see how crazy she goes as soon as He enters the room. Much like very dog in our home. There is something very very special about Nehemiah that draws EVERYONE including all animals too him. I suspect it is his gentle nature and loving spirit. Nemee has plans to go live with his big brother at college in 2014 as John will still be there working on his masters. He also wants to be a school teacher. He has also talked about possibly joining the air force. Whatever it is I know HE makes everyday a Better day here at Priceless Pups and I know he will continue to share that with all the people he encounters. Thanksgiving day 2010 John John met his new best friend that would walk him into his adult life. A bunch of wrinkles and a face that makes your heart melt! Winston an English bull dog. This is an old photo Of John and Nehemiah when they were just young boys. It was never uncommon for the boys to wrestle and the dogs would all get in on it. Giving a Whole new definition to the word DOG PILE! (PS NEMEE is under there somwhere.. you can see his legs He is covered by John and the dogs.!! LOL this has always been a common site at our home. John John was blessed to have the opportunity to play college football for two yrs until in the spring of 2011 he took a hit that changed his life. John was hit and paralyzed for almost a full minute. When his feeling came back to him he seemed okay and went on to continue playing a few days later. The summer of 2011 he began to experience loss of feeling in his arms. He was diagnosed with a degenerative disease of the spine along with complications from the hit he took that prior spring and was told he would never ever play football again. One more hit he would be a paraplegic his entire life. He is under doctor supervision and has the most amazing Neurological doctor and surgeon that keeps a close eye on him. John realized how God truly spared him and allowed him to still experience life as he know it . I saw a still young boy on a football field that day he got injured. Since that time I have had the pleasure of now seeing this young boy become a strong man who loves the Lord. In 2009 John John graduated from his high school class at Student of the yr , Athlete of the year and the ASF president over the entire student body. He has always been a hard working and very committed to his community around him. He is entering his Senior Yr in the fall of 2012 and studying to be an English high school teacher and wants to make a difference in the life of those children that are at high risk. He is far away enough from home that he gets to be a grown up... but close enough to come home for some of Mammas good cooking. He is about 3 hours away. He often comes home for a visit and when he does as I mentioned he is the biggest MUSH of them all and loves the puppies and misses all the dogs. On the rare occasion I am able to take a trip John is the one I call to arrange it with so he can come home and over see everyone. I love seeing the relationship and bond with him and Winston. They truly are one of the GOOFIEST parts of the Priceless Pups Team! She is a receptionist at parkway animal hospital. She is always available to help me get an appointment or get one of the vets on the phone should I have any questions. Becky recently adopted a puppy from Love Of Shorkies our Rescue I opened. She adopted a little terrier mix from me that was brought to me scared and homeless. They believe him to be a border terrier mix/ What an amazing match and she loves his to death. Often Becky is the first person our dogs and puppies meet when we are off to the vets office. She is so full of love and kindness and puts everyone's animals at ease as soon as you arrive. Becky gets my health certificates all filled out for the vet and myself so we do not have to do it. So we have more time to focus on the puppies or the dogs. She's offered many times help if I need it and is constantly calling and checking in our the new babies after they arrive. Becky always gets us in when we need to be seen and makes sure we have lots of time with the vets. As a breeder it is imperative we work with people that are efficient and understand that when we need to get in to see a vet it often means RIGHT NOW! Becky makes sure that happens. I am never put off or asked to take a back seat. I am treated and so are all our fur kids as a PRIORITY! and not a number. What a difference that makes. Thank you Becky for all the behind the scenes work you do for us.!!! One of Our Vets Techs at Parkway animal hospital. Eedie is the proud owner of one of our Imperial Shih Tzu puppies named Congo. (Now named Cooper) He comes to work with her everyday and the two of them make quite the pair. Eedie heart can not me measured in size as it is ENORMOUS! She is so good with all of our dogs puppies included.. that she is truly irreplaceable. For many years she wanted one of our puppies but the opportunity had not risen. Until Coopers adoption fell through. God had a special plan for her and Cooper now the two of them are inseparable. Ill never forget the day I brought him up to the vets office for her and handed him over. You could just see the love over flowing and Cooper looked up at her as if to say. "Hi Mom"
Eedie is amazing at the intake of our puppies that are being neutered or a C section if I have an emergency with a Mom in labor. She is so passionate about the after care they receive. She keeps me posted the entire way and goes way beyond the call of duty . Eedie has an huge impact on the lives of all my dogs and puppies. We love you Ms Eedie and we thank you for all your dedication to our fur kids old an small. If you would like to speak to Eeedie please feel free to call her and ask her about us and Cooper her baby she got from me. Please NOTE: Continental airlines is now United airlines. Different name but we have the same great people ensuring the safety of your baby! Mary Anne holding her Shih Tzu girl she got from us. It is scary to think about your baby being shipped to you right??? I understand because when we first started shipping it was a very scary thing. But after all these years we have come to know and trust Continental airlines and the staff that love and take care of our puppies from the time they leave me until they arrive safely home to you. Above is Melinie and Mary Anne. Mary Anne actually is the proud owner of one of our Shih Tzu Girls . Melinie is holding two of our Shorkies prior to their flight Jack Pot and Jelly Bean. These two ladies are not only a joy to work with but my puppies ALL adore them. The make sure that everything is perfect before they leave Seattle and the puppies have everything they need. I have to say my experience with them is always been positive and the love and compassion they express to all our puppies is amazing. These are just two of the friendly faces here in Seattle that ensure your puppy gets the very best of the best treatment. Continental airlines (UNITED) is truly the airline all puppy parents to be should look into when considering a puppy. They are the only airline that has yr around Temperature control so the puppies are never out of a 70 degree climate and have been awarded the highest awards in the PET SAFE PROGRAM. We have used other airlines and I have never received the one on one PERSONAL attention that our puppies receive. At most airlines you are just another CARGO number. Not here. Thank you to all my friends at Continental airlines that make sure Priceless Pups Puppies are treated like Royalty. I thank you and so do all our Puppy parents.